Thinking of doing some holiday shopping? We hope that when purchasing for loved ones and friends that you'll consider avoiding companies and products designed to restrict freedom and consider supporting companies and organizations that defend freedom. To help you make informed shopping decision and to avoid products that are defective by design, we've put together a short 2011 Holiday Buying Guide. We will be updating the guide throughout the holiday season, so please keep coming back for new tips and suggestions. Guardian article by Cory Doctorow on the BBC's dealings with Ofcom to add DRM to HDTV in the UK. If you haven't seen Sharing by xkcd, it's worth a look. In the strip, some friends discover a tree with a USB port sticking out of it. Upon connecting a computer to it, they discover an ebook -- Shel Silverstein's The Giving Tree, as a DRM'd Amazon Kindle file. The book cannot be opened and sharing is not allowed. A few weeks ago, we asked you to reach out to Barnes & Noble about their Nook eBook reader. Many of you did, and while Barnes & Noble have yet to formally respond, we can continue to put pressure on them. The current news is that Amazon plans to launch a color Android device, much like the Nook color. If we continue to put pressure on B&N, we can use this increased pressure from Amazon as a reason to make the Nook a device for everyone, not just large book publishers. American book retailer Barnes & Noble have launched the third model of their Nook ebook reader. We've previously written about the Nook, but until recently the Nook did not get much attention due to the limited options available. Things have changed and now the Nook represents a real threat to users because of its invasive DRM, close relationship with DRM champions Adobe, and because of its use of the Android operating system -- which might lead many to think the Nook is not defective by design. If you've logged into YouTube recently, you've probably noticed that they're pushing their Rental service pretty hard. YouTube Rentals brings full-length independent movies to YouTube, at a price -- they use Digital Restrictions Management (DRM) to severely limit how the videos can be used. Many devices, including certain Android phones, are unable to access them at all. This about-face goes against exactly what made YouTube useful in the first place -- the unencumbered sharing of video. 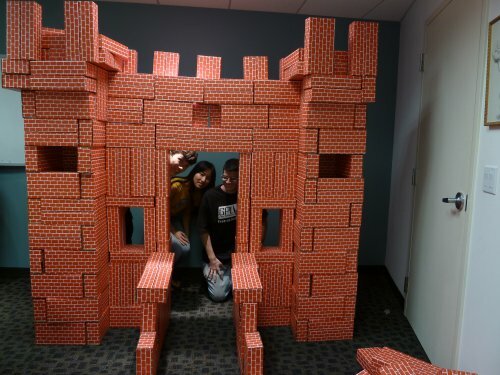 Over a period of 10 days, 138 people from twenty different countries made donations of $10 or more in order to send Nintendo's President and COO, Reggie Fils-Aime, a total of 220 bricks. 14 blog posts in 4 languages — it was especially nice to see our friends over at Creative Commons joining us in the celebration. The DRM-PT and Associação Nacional para o Software Livre (an associate of Free Software Foundation Europe) groups recently celebrated the Day Against DRM together. They hosted a radio show, and then a free movie event followed by a presentation on DRM. The next day, at Portugal's largest book fair, they distributed flyers and started a lively debate on the subject at the presentation of a pro-DRM ebook retailer. We interviewed Marcos Marado, the creator of DRM-PT, about the recent Day Against DRM events. In a little over a week, we surpassed our goal of taking 200 brick orders for Nintendo, to protest their claim that they have the right to "brick" (disable) users' devices when used outside of Nintendo's outrageous Terms of Service. Read more about Update: Over 200 bricks ordered for Nintendo, we reached our goal! Mura Nintendo prima che murino te. Il Nintendo 3DS ha una licenza di utilizzo che non dovrebbe essere accettata. Infatti le condizioni sono cosi' incredibili che ne abbiamo incluso un riassunto piu' dettagliato in una pagina a parte. Per far rispettare la licenza d'uso, Nintendo utilizza la Gestione delle Restrizioni Digitali (DRM). La combinazione di restrizioni tecnologiche e legali rende il Nintendo 3DS dubbio, subdolo e difettoso. Read more about Mura Nintendo prima che murino te. 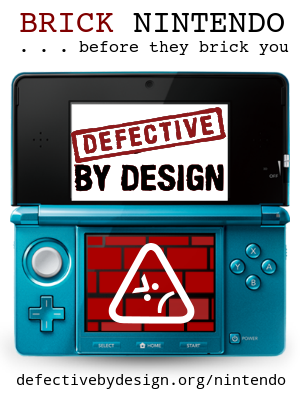 Tell Reggie Fils-Aime that the Nintendo 3DS is dubious, devious, and defective. 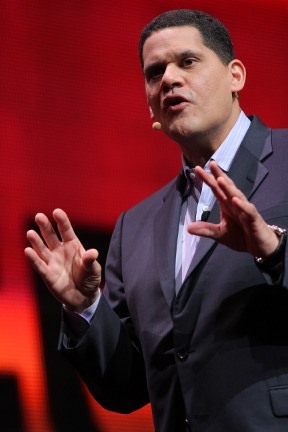 Read more about Tell Reggie Fils-Aime that the Nintendo 3DS is dubious, devious, and defective. Il 2011 e' stato un brutto anno per il DRM. Sony sta usando azioni legali per molestare e intimidire individui che modificano le loro PS3. Le librerie stanno per essere rimpiazzate da compagnie come Amazon e Apple che cercano di controllare l'accesso ai libri e monitorare chi legge cosa e dove. Abbiamo bisogno di inviare un messaggio chiaro: No al DRM! Clear your schedule for a worldwide day of action against DRM. On Wednesday, May 4th, we will be taking action to raise the stakes and increase awareness about the threats of Digital Restrictions Management -- in a very significant way! Leo Babauta is a simplicity blogger & author. He created Zen Habits - a blog with over 200,000 subscribers, mnmlist.com, and the best-selling books focus, The Power of Less, and Zen To Done. He has dedicated the Zen Habits blog and Zen to Done e-book to the public domain. Just because you buy a DRM-restricted game doesn't mean you can play it. An unfortunate forum comment temporarily left a gamer unable to play a single-player game purchased through the EA Store. Bioware forum poster Arno recently had his EA account suspended for 72 hours and then found he could not activate his previously preordered and purchased copy of Dragon Age II. 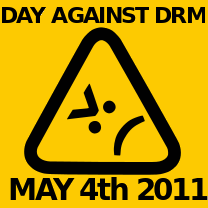 Wednesday May 4, 2011 will be the third annual international Day Against DRM. An existing digital restriction comes back for a second attack. 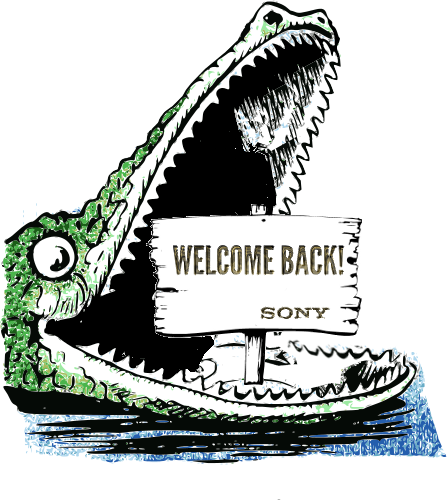 We have three ideas for action to take against the streaming media giants. The Guardian has more details. Hooray for Intel's loss -- Intel deserves this for its new DRM features in Sandy Bridge CPUs. If the world were automatically just, Sandy Bridge would fail over and over. But justice does not happen automatically: it is up to us to make Sandy Bridge fail. "The Free Software Foundation and Richard Stallman's work represents the most important work for freedom that this culture, the American culture, has seen in many many generations because it takes the ideas of freedom and it removes it from the ivory tower, and it removes it from lawyers, and places it in a community—a technology community—that is one of the most important communities defining the contours of freedom that most people in our culture and increasingly around the world will know." This article provides an important back story to our DRM campaign. Here at DefectiveByDesign we try to give our readers the bigger picture of how DRM is a threat to society's freedom: it's more than just about access to music and movies.